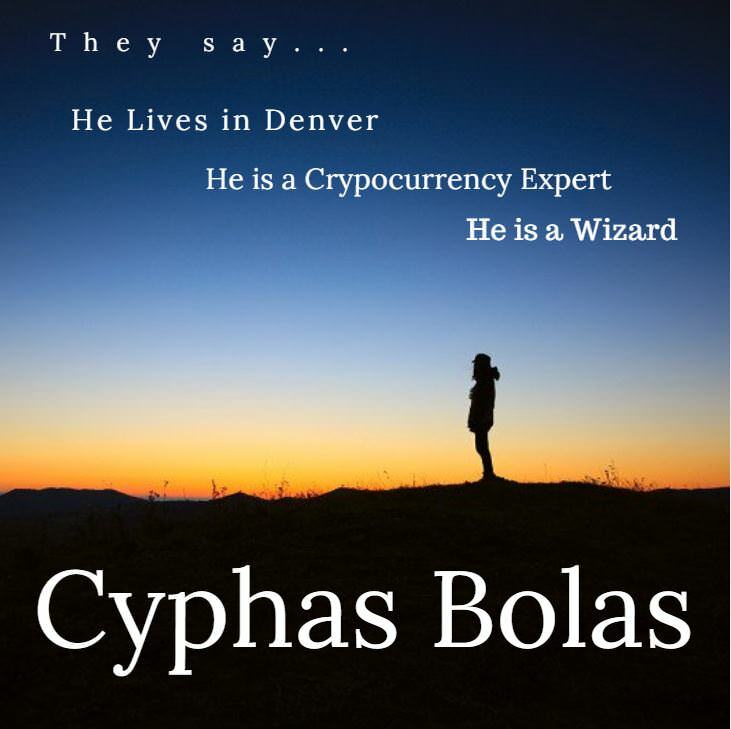 There is a man in Denver who knows a lot about cryptocurrency, and he calls himself Cyphas Bolas the Wizard of Crypto. This is post is both the story of how I came to know Cyphas as well as a short interview in which he humored me and answered a few questions. The Denver Crypo Community both from an academic and investing stand point is pretty strong. I am sure there are places in Japan, China and Ukraine that have more coders, and places in San Fran that have more techpreuners but Denver has its share of everything. One of the things that makes Denver's culture different is that they will meet up in Libraries, and Coffee Shops and talk. Just talk. 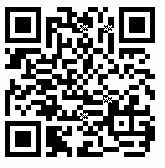 Not sell things to each other just discuss books, and cryptocurrency thought. The Dark Street Blog and Community was born out of these early library meet ups. 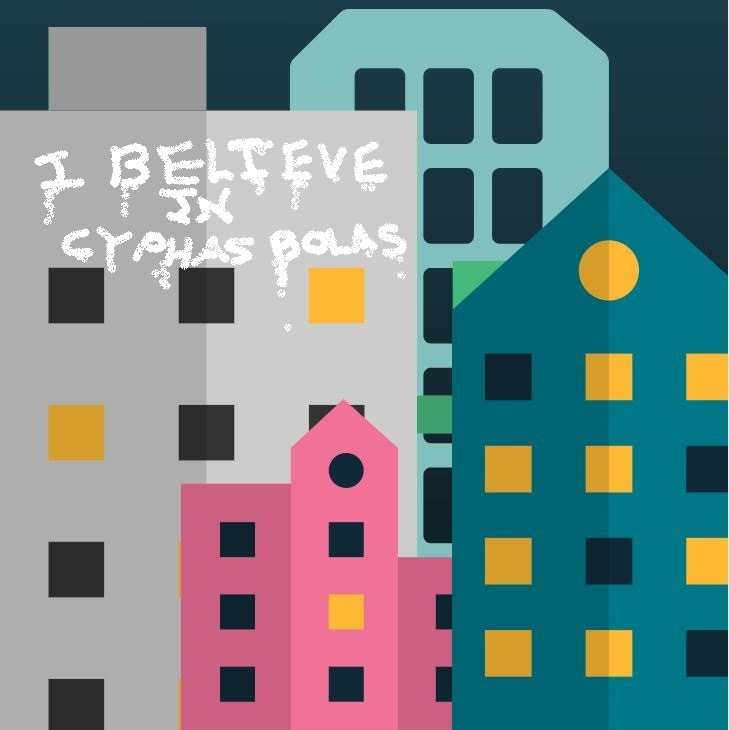 When our blog went out to find researchers and bloggers one of the names that kept coming out was Cyphas Bolas. 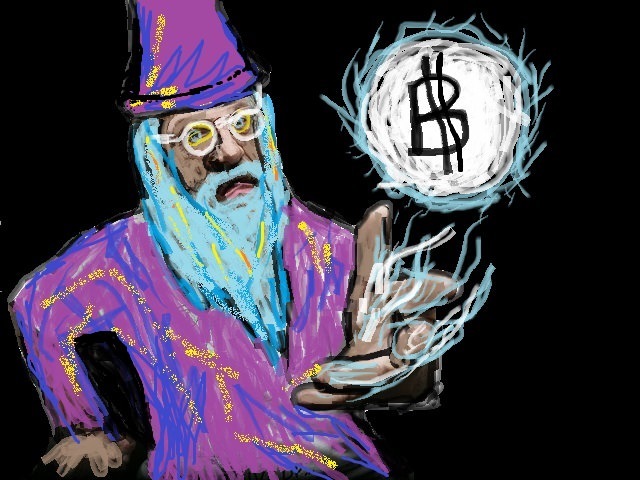 Cyphas apparently is a retired gentleman who shows up at many Cryptocurrency meeting in the Denver and Colorado Springs area. 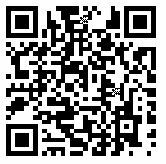 Cyphas reportly was very kind and very intelligent and would help people understand both crypography as well as cryptocurrency. 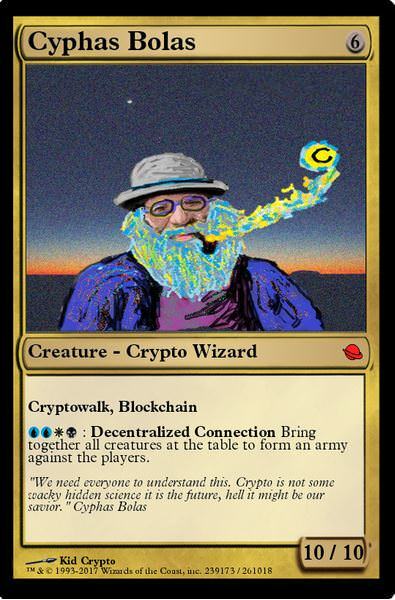 People said he referred to himself as Cyphas Bolas the Wizard of Crypto. He has no Twitter, no Instagram, and no Facebook. 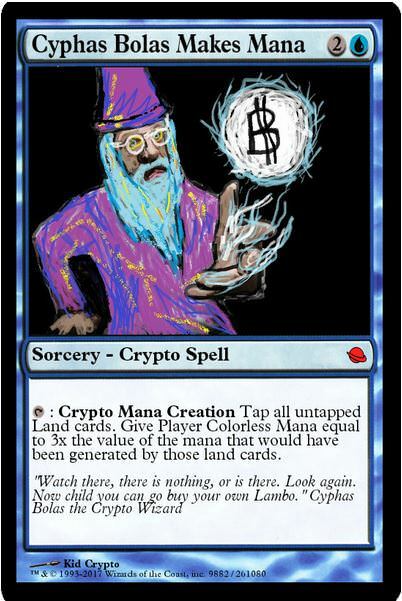 For a longtime we did not really think Cyphas Bolas existed. For a while even I thought that the story of Cyphas was a prank being pulled on me by my fellow Dark Street bloggers. In smaller red writing was a series of what appeared hieroglphics or alchemical symbols and in between it said. Around the black square with font it were edges of wild colors almost like tie dye shirt. 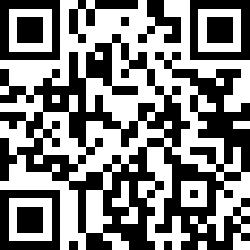 People who had the wallets proclaims that the wild colors were to help them find it easier. I asked to buy the wallet and the woman who had refused. She clutched it like Golumn clutching the ring. I might have even heard her say, "My precious" beneath her breath. 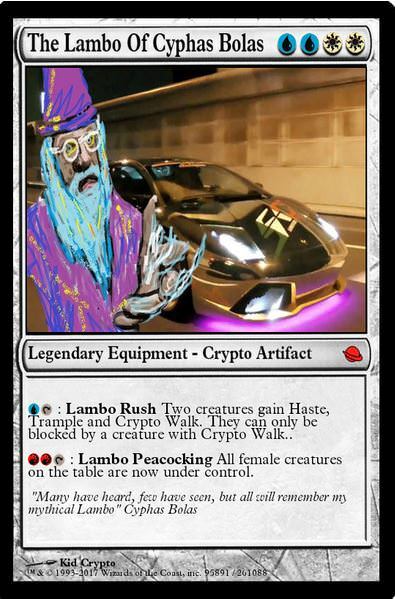 This made me all the more determined to one day meet Cyphas Bolas and learn the story of this real life Gandalf. Then one day while having a small meet and great in Koelbel Library sat down a man in a nice hat, with tidy white beard and tied dye shirt with about 6 books, (5 were on crypto and 1 was from a Scott Bakker fantasy series). I watched him for a moment. He looked nice, but I suddenly felt very shy. Finally I said "Hi I'm Lolo." He smiled warmly and took my hand and said. 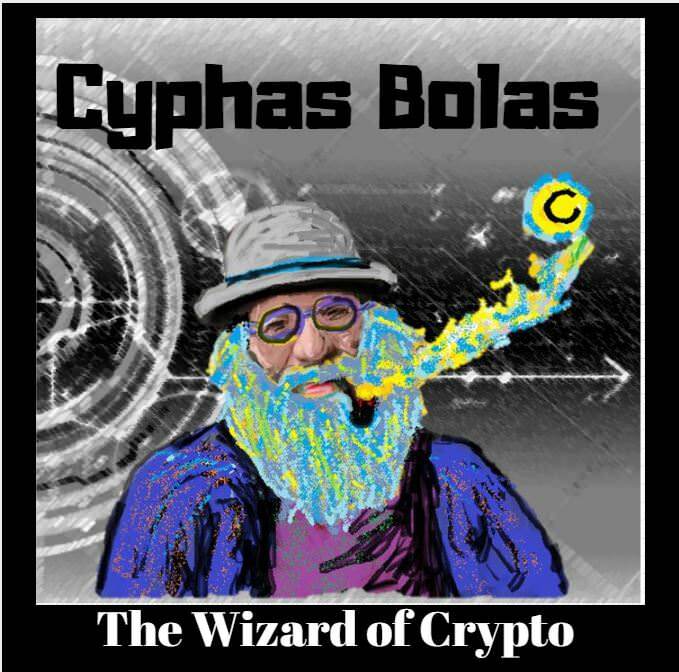 "Hi I'm Cyphas Bolas the CryptoWizard"
My mouth dropped. He was real after all. You don't meet a wizard everyday.